Cherrina Yoon is a Samaritan’s Purse communications intern in Vietnam. 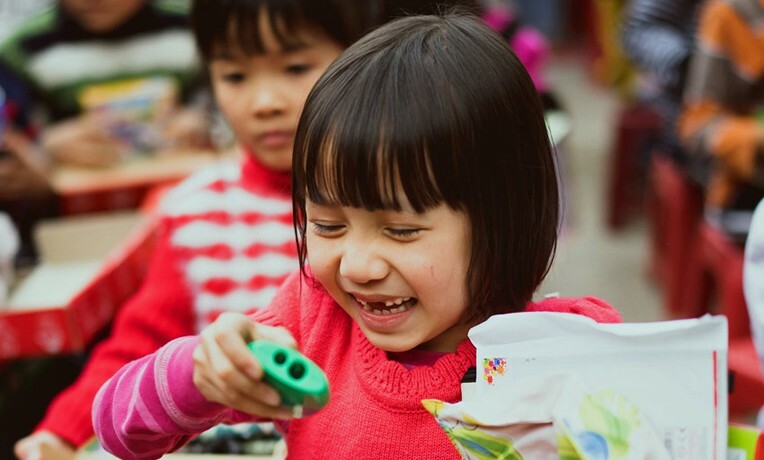 I’ve been in Vietnam for a couple of weeks now, and one of my favorite events so far has been an Operation Christmas Child shoebox distribution. On a recent occasion, the Operation Christmas Child project coordinator, a few volunteers, a translator, and I climbed into a minivan and headed toward the Quốc Oai District in Hanoi. It was a misty, gray day. I hadn’t expected Vietnam to be this cold. I watched the scenery change outside my window, the tall buildings and cement sidewalks sliding away as the freeway took us to green rice fields and tall, tropical-looking trees. When we arrived at the school’s empty meeting area, hundreds of kids came streaming out of their classrooms with their short, colorful stools in hand. Within a few hectic minutes, they sat in perfect rows, with girls on one side and boys on the other. The foggy air buzzed with the kids’ excitement, and we hurried to move the many cartons containing the shoeboxes to their respective places. Older boys in the back restlessly joked around with each other as different speakers came up to thank the government officials and Samaritan’s Purse. Girls in beautiful pink and white dresses danced with fans to traditional Vietnamese music. The whole event was like a festival for the school. The joy that these kids had on their faces was real. After the speeches and performances were over, our Operation Christmas Child project coordinator spoke to the children. “Are you ready to receive the gifts?” he asked. The kids, who were a quiet, passive audience just minutes before, excitedly yelled out, “Yes!” The project coordinator explained to the kids how we would distribute the boxes—girls first, then boys—and how once everyone got a box, they would open them all together. He went on to say more things to the kids that got them squealing with laughter, but I couldn’t hear our translator explain over the children’s booming excitement. Finally, it was time to give out the gifts. I think this might have been my favorite part, aside from watching the kids actually open the boxes. We shuffled out with piles of five boxes in our arms, giving them out one-by-one to the kids. Every child I extended a box to received it with both hands open wide, looking into my face and eagerly thanking me. I loved looking at their faces when they got the box; their expressions were a mix of giddy excitement and awe. After everyone had boxes in their hands, the project coordinator led the kids in a countdown: “Ready? 1 … 2 … 3!” Then the party began as kids opened their boxes to find strange and colorful goodies—bright yellow tennis balls, green sunglasses, toothbrushes, and T-shirts. The volunteers and staff members had a blast playing with the kids. We couldn’t understand each other, but laughing together while throwing around a ball or demonstrating how a certain gizmo worked was enough to make that time worthwhile. All too soon, it was time to go. And as quickly as they had formed their ranks, the children disappeared like a little army of bees retreating to their beehive. My hope is that each box that was prayed over and prepared with love will be a starting point for these children to wonder and marvel at the love that exists in this world. One day, maybe these children will search for and find the source of love Himself.